I've been scouting the hydrangea bushes as they slowly sprout leaves this spring. There's still not a flower bud to be seen, but I don't have to wait any longer to enjoy the pretty petals. 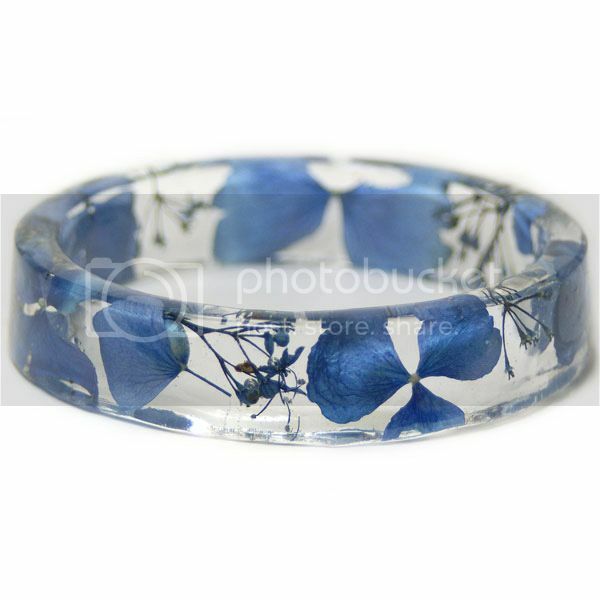 A beautiful blue hydrangea bangle bracelet bloomed in my handmade jewelry collection, thanks to Sarah of Modern Flower Child. I almost floated away like a dandelion seed when the flower bracelet arrived. Sliding it on my wrist didn't even weigh me down! Although her Etsy listings describe her crystal clear resin jewelry as lightweight, I was still surprised how light it was for such a chunky fashion bangle. Want to grow a real flower bracelet for free in your own summer wardrobe? Make sure you plant your entries in Sarah's jewelry giveaway before June 5, 2014! Disclaimer: I received this free bracelet as a thank you gift for hosting a jewelry giveaway. If you think your creations would harmonize with my whimsical ramblings, learn how to sponsor a giveaway here. I LOVE the real flower jewelry!!! This bangle is definitely a beauty. Thanks for introducing such a great shop! Her bangles are so dreamy, I've never seen anything like them before. This one is my favorite -https://www.etsy.com/listing/190342025 -beautiful! it's so pretty! and what a great idea. I can't wait for mine to bloom.